Is this a new Bulletin? My E350 has been at dealer since Tuesday AM - noise as described in the Bulletin plus an ongoing vibration (buzzing) issue in Steering Wheel. Called today to see what was going on, since I had not heard anything since dropping it off, and was advised he is waiting on parts - front strut(s). Asked why and was told, "...you heard a noise, so the tech thought we should do this." Not sure if doing just one or both - should they be done as a pair? If say they are just doing one, should I request the other one be done as well? Interesting timing; I just wish they could be up front about what is going on - I am happier knowing the truth and reason for an action, even if it isn't what one would hope for. Also replacing a defective rear shock absorber PLUS just had a defective front shock replaced in February!!! Is my vehicle a Zitrone? Is this a new Bulletin? You are a wealth of valuable information adn all that visit this forum surely appreciate your knowledge and insight. In the case of this bulletin, should both struts be replaced or is replacing one acceptable? Are there any details/specifics available on what the changes/modifications are on the new units? Internal damping module of strut was modified, see “Cause” in bulletin copy I sent. Thanks. LAST question (I hope): Should the vehicle have an alignment after the struts are replaced? Does replacement impact the alignment settings? Does replacement impact the alignment settings? No, the only additional step would be to check headlamp adjustment. LI80.61-P-049924 MAR11 – 204/207/212 Keyless-Go “key not recognized” unable to start engine, update KG control unit software. LI54.30-P-050163 MAR11 – 207 without memory package (275), backrest not locked continues to be displayed after locked correctly, update IC software. LI82.70-P-051455 MAR11 – 212 called party has difficulty understanding driver; voice inputs via VCS are misunderstood, update COMAND software. LI91.10-P-049894 APR11 – 204/207/212 noise or play at seat adjuster, shim will be fitted. Would it be possible to see the entire description of this issue? Certainly, PM email address and I will send bulletin. LI80.57-P-051521 – 207 no crank/start/intermittent no crank, if EIS is part # 2045455732 replace with 2045458132. LI91.25-P-051700 – 212 as of VIN A344516 up to A387562 multicontour seat inoperative replace backrest padding (massage unit and actuator are permanently installed in padding). 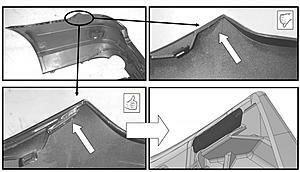 LI91.25-P-051599 – 212 dynamic seat function or multicontour system inoperative replace air cushion on front seat backrest with improved part. Hey Konigstiger, I used this DTB hoping it would give me the new Command upgrade that some here have gotten (with the Bluetooth streaming, fixed POI's-where it doesn't give you a random City location, better graphics, A/C display on the bottom of the screen, Nav Map graphics upgrade, etc. ), and after them saying that they were uploading new software for 2 hours (which I know they did, because apparently it crashed right before it was complete the first time, and I had to leave the car overnight), I see absolutely no changes to my Command. Did I give them the wrong code for what I seeked? Service Campaign 2011030004 MAY11 – MY11 212 dealer will check vibration damper and replace if necessary. If the first 3 digits on barcode are 167, replacement is necessary. Approximately 41 vehicles are affected. LI72.12-P-051929 MAY11 – 212 wagon up to VIN A406843; cannot open rear door in low outside temperature, strip on the inner sealing lip can become drenched and then freeze onto roof frame, dealer should install modified left & right window guide rails. LI32.22-P-052062 – 212 thumping from area of the front axle when driving over speed humps when the suspension strut rebounds, the rebound buffer spring causes a metallic knocking noise. Dealer should flash Airmatic control unit. LI54.21-P-052072 – vehicles with 276/278 engines CEL in IC but engine does not display any problems (i.e. : fault code P060600) update ECU. LI42.47-P-052197 - e63 VIN A415231-A421136 when attempting to switch on the Attention Assist function fault message appears, perform SCN coding of ESP control unit. LI91.25-P-052529 SEPT11 dynamic seat inoperative shortly after restart flash multicontour seat control unit with new software. LI03.10-P-052286 SEPT11 knocking noise from engine, inspect cylinder walls for scoring if found engine must be replaced. Affected vehicles are mostly production dates from 8/10 to 11/10 but might be outside this range situation was corrected as of engine # 2729xx 31932895 & 2739xx 30441186. LI27.60-P-049981 OCT11 hard shifts, poor start characteristics, uncomfortable jolting – check oil level, check for software releases and check engine for unmetered air. Where are the engine numbers located? Don't know where they're located *on the vehicle* but you can get it from the "datacard" available at startekinfo.You can sign up for free (for the first year IIRC) and once signed up you can get all sorts of interesting,useful,info about *your* vehicle (including your engine number) by entering your VIN number. Service Campaign 2011100004 NOV11 – 2011 w212 Central Gateway (CGW) may not meet specifications dealer will update software. Approximately 2,575 vehicles affected have dealer check VMI to see if VIN is included. Recall 2011110002 – MY11 212 diesel fuel filter may develop leaks approximately 6,784 vehicles affected. Owners should receive a letter or have dealer check VMI to check if VIN is included. LI46.20-P-049852 – 207 all, 212 except 4matic honking/squeaking noise when steering in both directions mainly occurs when warm. Radial shaft sealing ring to steering system will be replaced. LI83.00-P-051420 – 212 up to VIN 1A411562 & 218 up to 1A004916 whistling or humming noise. If the noise disappears when opening a window, the problem is caused by the drain grommets of the sliding roof hose @ left & right rear. Oh crap! I have a 2011 E350 and on one side, the bumper protrudes (it has protruded since day 1 I bought the car). My car has a build date of 7/11. Does this mean it doesn't fall under this bulletin?